WELCOME TO ANCOATS - 8TH WONDER OF THE WORLD! 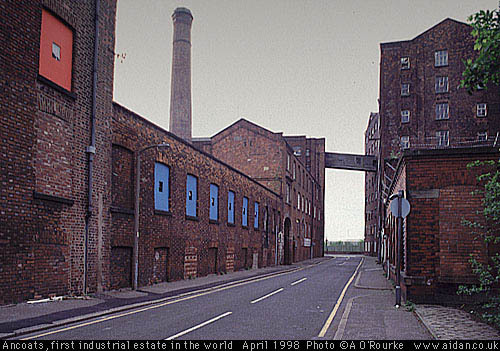 ANCOATS, FIRST INDUSTRIAL DISTRICT IN THE WORLD, could become recognised as a world heritage site. Culture Secretary Chris Smith has recommended 32 locations in Britain, including the Greater Manchester districts of Ancoats, Castlefield and Worsley. Britain already has 17 world heritage sites, among them Stonehenge and Fountains Abbey (both of which I've visited - Fountains Abbey, in Yorkshire, is truly outstanding). The Great Wall of China, the Taj Mahal and Angkor Wat in Cambodia are three famous world sites (which I haven't yet visited!) already designated as of outstanding cultural and historical value. But are Castlefield and Worsley really as significant as the Pyramids or the Grand Canyon? I think so, and apparently so do tourists, who were interviewed on BBC's Northwest Tonight - one visitor said Castlefield was just amazing. 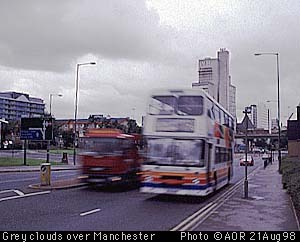 But another said that Manchester's most remarkable and memorable feature might be its weather! More below. WYTHENSHAWE HOSPITAL, which only last week experienced a fire in one of its operating theatres, was on Tuesday night hit by another more serious fire which has put several operating theatres out of action. One patient, five year old Rory McGagh, had to be evacuated in the middle of an operation, as reported by Kevin Feddy in the MEN. Orthopaedic registrar Krishnan Rajesh was leading the operation was leading the operation when the call to evacuate came. The fire was apparently caused by an arsonist. It seems amazing that a malevolent intruder could penetrate and cause serious damage to a hospital as technologically advanced as Wythenshawe. And what kind of person could willingly deprive the public of life-saving facilities? It's doubly ironic in the wake of the Omagh bombing, that medical facilities here are destroyed, while in Omagh similar units were used to save the lives of bomb victims. GLORIOUS WEATHER DOMINATED the middle of the week over much of the country, including Manchester. Suddenly, people were out doing the things you associate with sunny days: dressing in shorts and T-shirts - sitting on the grass at lunchtime, as in the photo at the top of the page - driving in cars with the top down. I was out with my camera and lots of film. I've taken quite a few, so please keep dropping in over the next week or so to see the fruits of my labours. I have been away from Manchester for the last 11 years and have just found your web site. Thanks for all the pics - they brought back a lot of memories. Any of Failsworth? I'll take some the next time I'm in that area. Is there any particular photogenic place in Failsworth you could recommend? How about Atlanta? The two cities have many similarities, such as wealth from the cotton trade, regeneration of run-down urban areas and are similar in population. I believe (from my family in Worsley),that Manchester traffic is approaching the horrendous level we have here in Atlanta. By the way , my wife (from Co.Mayo) and I, moved here four and a half years ago from Salford but are contemplating a return to Ireland in the near future. Thanks for all the news from home. P.S. I forgot all the sporting events the two cities have/will be hosting. Thanks for the suggestion. I've never visited Atlanta, but I've heard it's a boom city. I'll suggest it to people at the Town Hall. The traffic here in Manchester isn't as bad as they say it is. They were saying the traffic was bad 50 years ago. There are more cars on the road than when I learned to drive, but I'd only use the word "horrendous" to describe somewhere like Bangkok - now there the traffic really is bad! Here we have plenty of superb roads that speed the traffic on its way, subject to occasional traffic jams! Look out for an Eyewitness in Dublin at some time in the near future - that's where I went to university. My parents are from County Limerick. I have been away from the net for some time, but to remind you, I was the chap looking for relatives of Frank Swift! Your format has changed since the last time, so I hope this reaches you OK.
My Mother grew up in Salford at the turn of the century and WWI and was a seamstress. I have been trying to find out about a place she worked in the City. I believe it was called "Lightbounds. My spellling will be off the mark, but that is how she pronounced it. I am on a new server so I hope this gets through to you. There is a road in North Manchester called Lightbowne Road - that might also be the name of a district, as with Greengate in Salford. Unfortunately I don't know the origin of the name. Can anyone help? Anyhow thanks for the message, and keep visiting Eyewitness in Manchester and Manchester Online!